1. Irma spooks markets: Hurricane Irma is moving through the Caribbean, pushing up commodity prices and applying pressure to travel stocks. The price of orange juice futures for November delivery spiked 6.5% on Wednesday. U.S. oil futures rose 0.4% to trade just below $49 per barrel. On Tuesday, shares in cruise operators dropped as the storm gathered strength. Royal Caribbean Cruises (RCL) lost 4%, while Carnival Corp (CCL) fell more than 3%. 2. No NAFTA breakthrough: The second round of NAFTA renegotiation talks ended Tuesday without a major breakthrough. Trade experts are concerned that the U.S. still hasn't fleshed out the finer points of its goals as talks progress. President Trump has threatened to pull out of NAFTA, which he calls the worst trade deal in history. The next round of talks will start on September 23. 3. 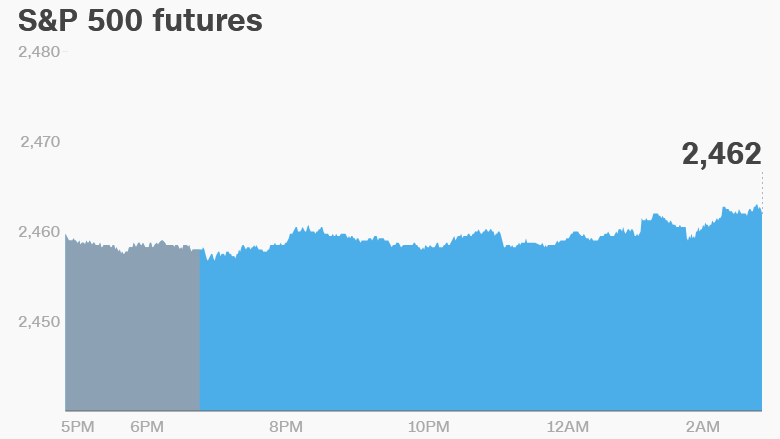 Global market overview: U.S. stock futures were edging higher early on Wednesday. European markets opened lower, while Asian markets ended the session mostly down. The Dow Jones industrial average closed 1.1% lower on Tuesday, while the S&P 500 lost 0.8% and the Nasdaq shed 0.9%. 4. Stock market movers: Hewlett Packard Enterprise (HPE) was up more than 4% in extended trading after its earnings beat expectations. 5. Economics: The U.S. Census Bureau will release its trade balance report for July at 8:30 a.m. ET. Australian GDP grew 1.8% in the second quarter compared to the same quarter last year, according to official data released on Wednesday. That was slightly below analysts expectations, but on par with the first quarter growth. The Bank of Canada is set to announce its latest interest rates decision at 10 a.m.